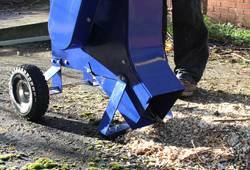 The T-Mech wood chipper is assured to make light work of excess twigs, leaves and branches. Ideal for professional gardeners and landscapers but also great for amateur gardeners that need to clear that garden waste! The powerful chippers have an incredible 2400 – 3600rpm blade speed to maximise efficiency when chipping! Wood chippers are great to reduce leaves, trimmings and branches but they can also help to turn your garden waste into compost! Dependent upon the type of garden waste, it can help plant growth and is highly nutritious for gardens.